Here we are, day one of the cookie baking challenge. The challenge part would be eating the cookies without gaining an ounce of fat. These cookies are an old favorite of mine-this is a recipe my mom has made since I was small. 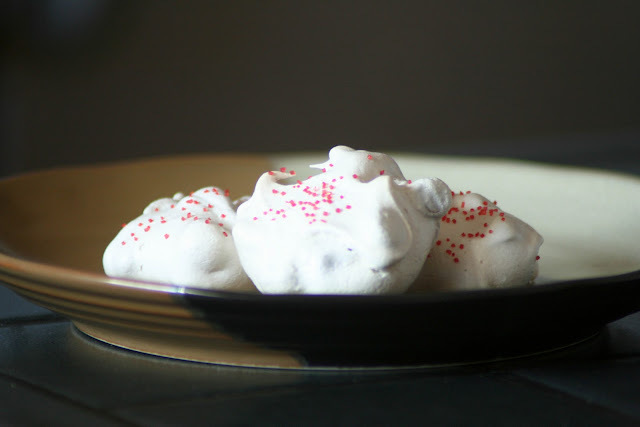 Delightful bites of airy white-only five ingredients (six if you count the irresistible red sparkly decor) and then you...forget about them. So easy! Preheat oven to 350 degrees. Beat egg whites until foamy; add dash of salt. Gradually begin adding sugar (1 tablespoon at a time). Beat until mix becomes stiff and peaks form. Fold in vanilla and chocolate chips. Spoon by rounded teaspoons onto foil-lined baking sheets. Place in oven and immediately turn off the heat. Do not open the oven door for at least eight hours. 8 hours! Holy moly, that's some patience to have!